We’d love your help. Let us know what’s wrong with this preview of Tecumseh by John Sugden. If Sitting Bull is the most famous Indian, Tecumseh is the most revered. Although Tecumseh literature exceeds that devoted to any other Native American, this is the first reliable biography--thirty years in the making--of the shadowy figure who created a loose confederacy of diverse Indian tribes that exted from the Ohio territory northeast to New York, south into the Flor If Sitting Bull is the most famous Indian, Tecumseh is the most revered. Although Tecumseh literature exceeds that devoted to any other Native American, this is the first reliable biography--thirty years in the making--of the shadowy figure who created a loose confederacy of diverse Indian tribes that exted from the Ohio territory northeast to New York, south into the Florida peninsula, westward to Nebraska, and north into Canada. A warrior as well as a diplomat, the great Shawnee chief was a man of passionate ambitions. Spurred by commitment and served by a formidable battery of personal qualities that made him the principal organizer and the driving force of confederacy, Tecumseh kept the embers of resistence alive against a federal government that talked cooperation but practiced genocide following the Revolutionary War. Tecumseh does not stand for one tribe or nation, but for all Native Americans. Despite his failed attempt at solidarity, he remains the ultimate symbol of eavor and courage, unity and fraternity. To ask other readers questions about Tecumseh, please sign up. An excellent well-researched biography of one of the most interesting characters in American history. More than a biography, Sugden’s book is also a tale of how the British, the Indians, and the Americans struggled for power in the Old Northwest. Sugden does a great job documenting Tecumseh’s life and putting it in the context of the Indian-white struggle for power in the Old Northwest. The meat of the book is Tecumseh’s dream of an Indian confederacy to resist white expansion into that territory An excellent well-researched biography of one of the most interesting characters in American history. More than a biography, Sugden’s book is also a tale of how the British, the Indians, and the Americans struggled for power in the Old Northwest. Sugden does a great job documenting Tecumseh’s life and putting it in the context of the Indian-white struggle for power in the Old Northwest. The meat of the book is Tecumseh’s dream of an Indian confederacy to resist white expansion into that territory. Sugden’s biography features many remarkable characters such as Tecumseh’s brother Tenskhatawa (“The Prophet”). It also shows the various different approaches the tribes took in dealing with the white man. Really, the decline and fall of the Native American lands. As Manifest Destiny became more imminent, Tecumseh attempted to fend off the advancing settlers and form a Federalist type governance amongst the varied tribes across the current Midwest (central Indiana to Detroit to Cincinnati). Ultimately, his alliance with the British during the war of 1812 failed and led to his demise. It is a purely education book, but gives the author's opinion here and there given the rumor and romantic subject matter. 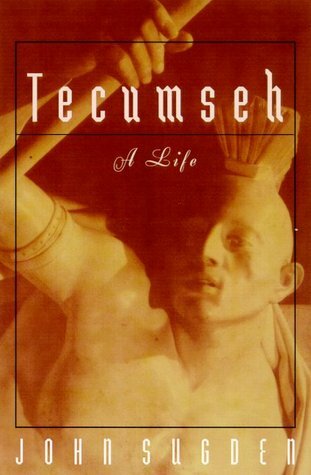 One of the better biographies on Tecumseh I've read (and I've read quite a few). The importance of his brother, "the Prophet" was highlighted - rather than just passing him off as a tool used by the more well-known man. And the extensive research, coupled with a fairly objective portrayal of Tecumseh, the man - rather than Tecumseh, the legend - makes this an engaging, comprehensive history. John Sugden's biography of the great Shawnee chief Tecumseh is an authoritative investigation of his life and legend. Sugden investigates the legend and highlights what he understands to be the facts, based on painful investigation of the known sources relating to Tecumseh. This he successfully does, while providing the reader with an understanding of Tecumseh the man, alongside Tecumseh and his mission. For me the book also provides an insight into the machinations of early American government, John Sugden's biography of the great Shawnee chief Tecumseh is an authoritative investigation of his life and legend. Sugden investigates the legend and highlights what he understands to be the facts, based on painful investigation of the known sources relating to Tecumseh. This he successfully does, while providing the reader with an understanding of Tecumseh the man, alongside Tecumseh and his mission. For me the book also provides an insight into the machinations of early American government, expansion and imperialist ambition. As has usually been the case with native peoples, the Shawnee nation (and other native American nations) was exploited and treated extremely poorly by the young American nation. I hated this one. It was dry, and heavy, and Sugden would present a bunch of stuff as fact, only to later tell you that it was conjecture. Let's waste our readers' time, shall we? So that ticked me off. Really, just the whole tone of the thing ticked me off. Who does Sugden think he is? He wasn't at all objective, and seems to think his opinions are law. I always find that distasteful to read, even when I agree with the person, and I didn't agree with him most of the time. Recommends it for: No one else really.